20110329 - Up in AM, ready for the day and on a couple calls. Then packed the fam in the car and headed North to the Farm. Got to the Farm, had some lunch and out to work. 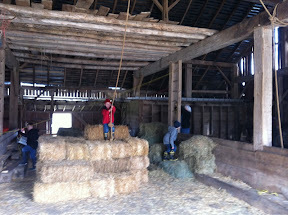 We got the barn floor cleaned up, fort built, rope tested and things as secure as possible. Then into the spring house. J found a HUGE frog and the boys took it to the barn to have the frog try their new zip line... We got the fire pit stable, tank partially cleaned out, tables set up... Enough for one day and everyone out to a China Buffett. Back to base, boys cleaned up and watched E.T. 20110328 - Work wrap up today. A good dinner with the fam. Took J to soccer w/ D freezing. Meijer for milk on the way home. Boys to bed and off to Bible Bangers, much better meeting this week.